Graphic journalism, cartoon reportage… however you want to describe it, the power of comics to efficiently communicate the central issues of a given topic in a way that is both informative and immersive has been widely in evidence in recent years. From Joe Sacco’s on-the-ground coverage in regions of conflict in work like Palestine and Safe Area Goražde to Daryl Cunningham’s analytical debunking of the fallacies of pseudo-science in Science Tales, or his examination of the banking crisis in Supercrash, this use of the medium to explain comparatively involved questions and situations is probably second only to the rise of the graphic memoir in enlightening contemporary non-comics readers to the accessibility of the form. 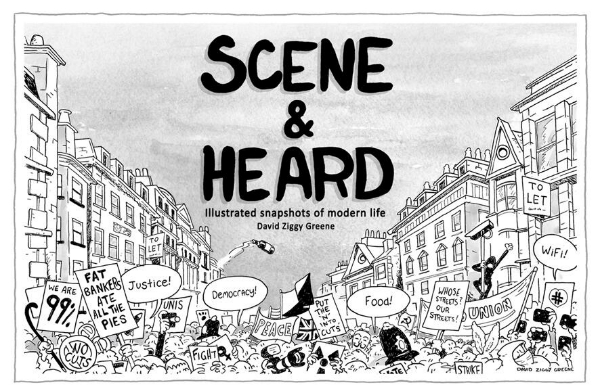 David Ziggy Greene’s Scene & Heard – a distinctive take on this area of comics practice – has been a feature in British satirical magazine Private Eye for two years now. In each of these packed, intricately detailed landscape strips Greene has investigated a topical issue from the UK headlines, spoken to members of the public either directly involved or sitting on the peripheries of the subject matter, and then presented their views on the page as a kind of comics vox pop. Coverage has ranged from areas of political debate to questions of social interest, and focused on stories of both major national importance and those that are relatively trivial in scope but nonetheless just as entertaining under Greene’s watchful eye. This summer has seen Greene self-publish a bumper collection of these “illustrated snapshots of modern life” allowing fans of his work to view the thoughts of the great British public on such diverse topics as the Olympics, dangerous dogs, gay marriage, fracking, the bitcoin phenomenon, the protest movement, the phone-hacking trial, and how much pocket money children should get. As you can imagine, those views are a fascinating mix of the often random, the sometimes insightful and the occasionally utterly bizarre; in that latter case there are responses that almost border on non sequitur. Private Eye editor Ian Hislop describes the book as “a bold attempt to reintroduce cartoon reportage into Britain” and it’s hard to argue with his assessment of the strip as “cleverly observed and executed”. 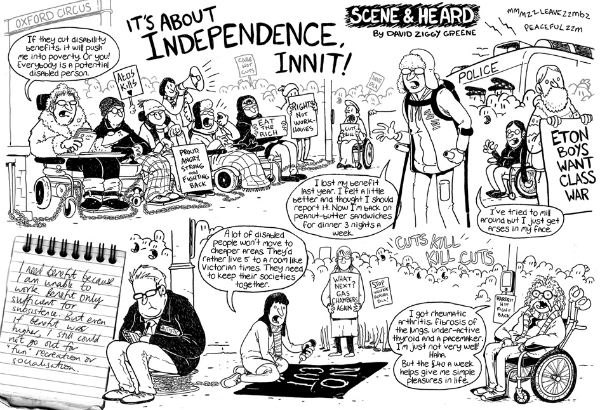 Fans of the UK small press scene will be well aware of Greene’s distinctive visual approach as both caricaturist and storyteller in self-published books like Where’s North from Here? but for those coming to his work for the first time Scene & Heard is the perfect introduction to one of our most under-rated British comics talents. It’s also an interesting contrast to some of his minicomics material wherein Greene has let his riotously overactive imagination go to town with visual narratives that are violently slapstick, splendidly grotesque, and wonderfully over the top. In Scene & Heard we see a far subtler side to his comics repertoire as he takes the role of observer, one step removed from the action, respectfully allowing his “characters” to speak for themselves, and fashioning a much more subdued authorial presence. 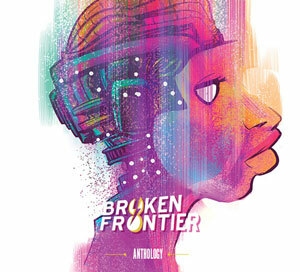 What remains a constant throughout his work, though, is that underground comix vibe to his visuals, that fluidity to his layouts and the physical elasticity of the folk that populate his pages. 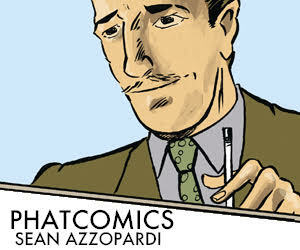 Replete with behind the scenes extras – early pencil sketches, unpublished strips, background commentary, notes on the research aspects – Scene & Heard is not just an album of his Private Eye pieces but also a diary of Greene’s creative process on this project itself. To condense each complex subject into a handful of soundbites that are so inherently revealing about the diversity of public opinion on any given matter is a tribute to Greene’s perceptive approach to this undertaking. 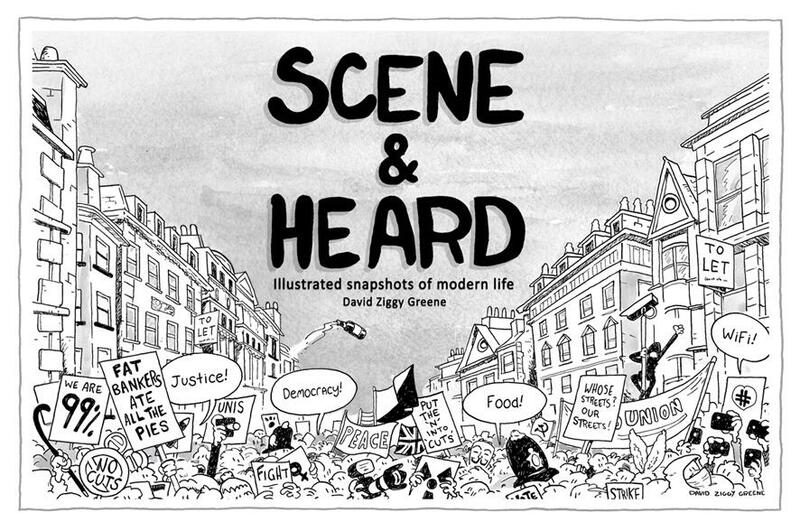 Those wanting to find out more about Scene & Heard should make sure they visit the current exhibition of art from the book at London’s Orbital Comics which runs until October 10th. For more on the work of David Ziggy Greene check out his website here. Scene & Heard can be bought from his online store here priced £10.00.